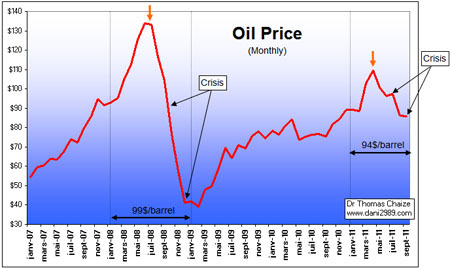 In 2008 the price of oil has reached the same level as in 1980 (corrected for inflation), or + / - 100 dollars a barrel. In 1980, during the second oil shock, the origin of the increase was the Iranian revolution and the war Iran / Iraq. In 2008, no exogenous cause: the war, but an endogenous problem: the peak oil. The different backgrounds of the two crises challenge us to pursue different strategies. In 1980 it was necessary to flee the oil sector, now is probably the best line of long-term investment (oil and energy at large). The next signal will be the important transition from the 100 dollars per barrel of oil (annual average). In 2008 after the record high price of oil the world has witnessed the worst systemic crisis since 1929. This year, while the price of oil reached nearly (94 per barrel of oil) the same price level as in 2008 (99 dollars per barrel of oil) the world economy has experienced a kind of violent spasm that caused the downfall of some indices and companies at levels close to those of the 2008 crisis. The difference with 2008 is that the level of world oil production all liquids was "anticipated" rising prices, so that the price of oil does not fly too high. The world oil production has exceeded temporarily high of July 2008 a few months before the price increase in January 2011 with 88.3 million barrels / day. With peak oil, the price of oil remains on a very long-term upward trend, punctuated by violent falls short every time the economy can not bear a price level too high. But gradually the production of conventional oil is stagnant, and probably see down the global economy will have to adapt to a barrel of oil more expensive.